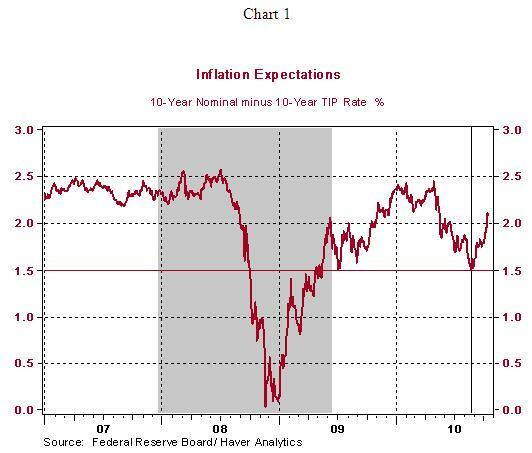 Inflation expectations, measured as the difference between nominal 10-year Treasury note yield and yield on the 10-year inflation protected security, has moved from a low of 1.49% on August 24, just prior to the August 27 Bernanke speech, to 2.09% as of October 15. The upward trend of inflation expectations is a vote of confidence about the success of QE2. Actual inflation, based on personal consumption expenditure price index, the Fed's preferred measure, moved up 1.47% in August on a year-to-year basis (see chart 2). The core personal consumption price index, which excludes food and energy, rose 1.39% in August, with both price measures showing a similar gain. 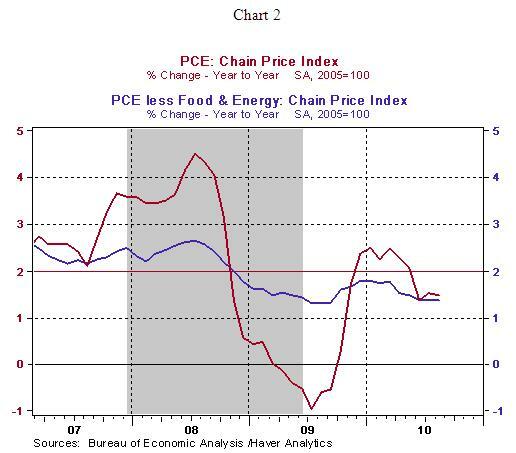 The central tendency of the Fed's long-term inflation forecast is 1.7%-2.0%. Bernanke's speech on October 15 stressed the difference between actual and desired inflation readings and why the Fed may need to act to address the low inflationary environment. Inflation expectations from market data will guide markets in the months ahead, whether the Fed is moving away from a deflationary situation. 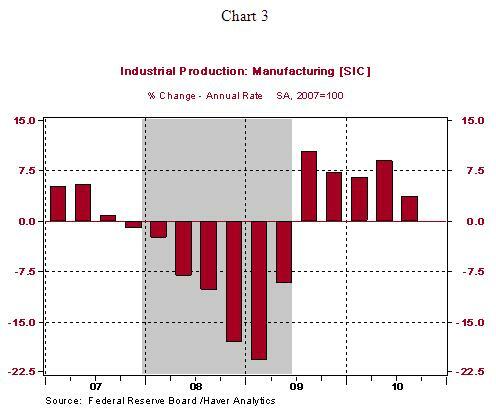 Industrial production fell 0.2% in September, after a 0.2% gain in the prior month. Excluding production at mines (+0.7%) and utilities (-1/9%), factory production slipped 0.2% in September after a 0.1% increase in the prior month. In the third quarter, factory production grew at an annual rate of 3.6% vs. a 9.1% increase in the second quarter, which is consistent with slowing economic conditions predicted for the second-half of 2010. Although auto production increased 5.0% in September and high-tech production rose 0.3%, factory production excluding autos and high-tech fell 0.2% in September. The operating rate of the nation's industries fell one notch to 74.7%, while that of the factory sector moved down to 72.2% from 72.3% in August. The historical average of the factory operating rate is 79.2%. 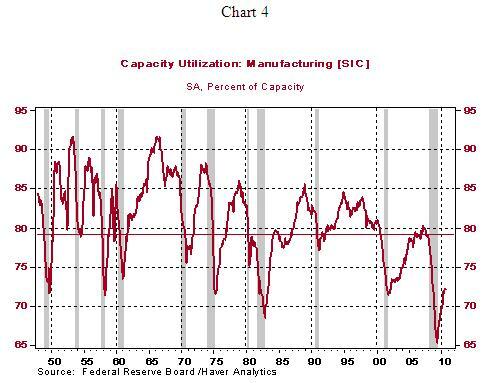 Slack in the nation's factories is part of the reason businesses can postpone equipment and software spending in the near term.